With August nearly done and a new school year begun, I keep expecting a shift to occur. You know, those subtle changes that come with the changing of seasons. The air gets a little crisper in the early morning hours. The light begins to change and long shadows fall a little earlier. Mother Nature hints that autumn is finally making his way around. In the desert, it is a very subtle shift, nearly imperceptible. But you can feel it, if you’re paying attention. And I, for one, have been attentively and not-so-patiently awaiting that shift. Unfortunately, Mama Nature’s not quite ready to indulge, so summer is still very much in full swing in these parts. C’mon, Summer. Cool it! Yesterday’s high was 111 degrees. Ugh. Too hot for housework, too hot to play, too hot for projects and definitely too hot for cooking. The poor mutts are gettin’ cranky, tired of being housebound and anxiously awaiting that shift. 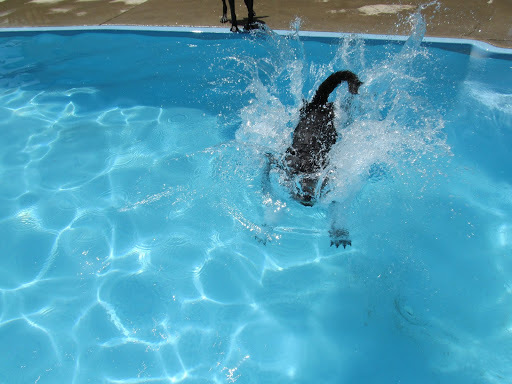 Summer life is hard for a big desert dog (especially a black one). Running free is a thing of the past, outdoor adventures are few and far between and hunting lizards only happens in your dreams. 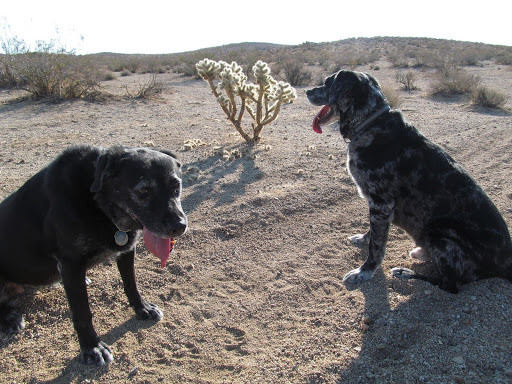 Even in the early morning hours, fifteen minutes of running in this dry heat is all it takes before you find yourself panting uncontrollably and desperately searching for shade in the puny shadow of a lone cholla. Poor pooches. I can relate. Well, we’re all tired of the heat, completely drained of energy and motivation, but life doesn’t stop because it’s too hot. So, I think I’ll get something cool to drink and get to it. Hydration is an important issue this time of year. Even with the cooler running non-stop, inside temperatures are high and any movement at all produces a sweat. Stepping outside is like being thrown into a raging furnace and every drop of moisture in your body instantly evaporates. Cold and hot water from the faucet are one and the same and the ice-maker just can’t seem to keep up. 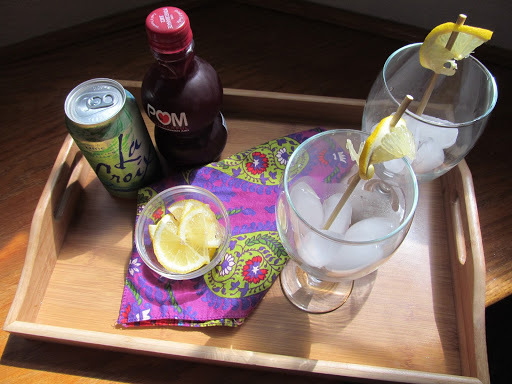 Tired of trying to hydrate and cool down with a glass of warm water, I set out to create a few healthy beverages to help refresh my energy and replenish my spirits. 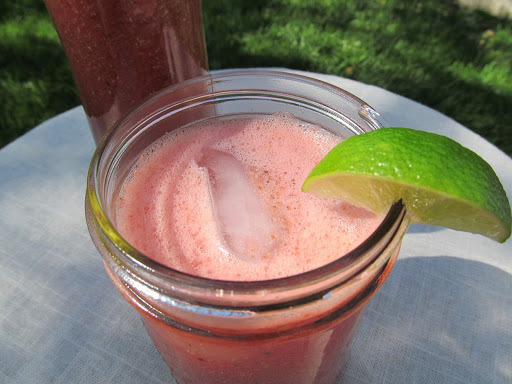 Let’s start with a Watermelon Chia Agua Fresca. 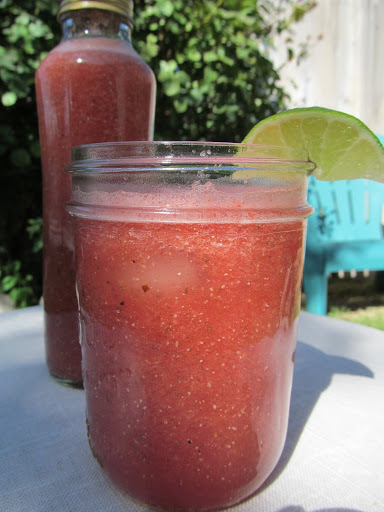 In Spanish, agua fresca means “fresh water”. These drinks are typically made of fruit-infused water and they are a light, fruity way to replenish on a hot summer day. 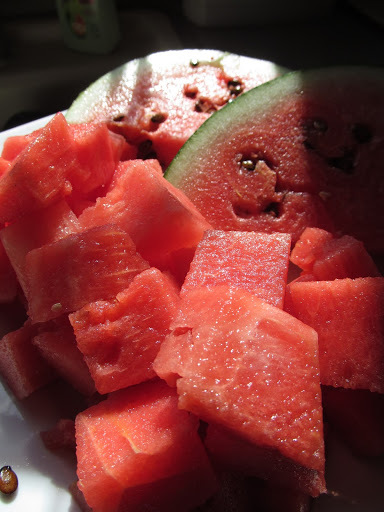 I had half a watermelon in the fridge begging to be consumed, so I decided to try making an agua fresca with watermelon. Adding chia seeds to your beverage is a good way to sneak a little superfood power into your hydration process. Chia seeds are not only great for staying hydrated, they also provide a source of protein, fiber, minerals (like calcium and iron), antioxidants and omega-3’s. Can’t go wrong there…toss ’em in! First, I put about one tablespoon of chia seeds in a cup of water and set it in the fridge to “gel up” for about 20 minutes. 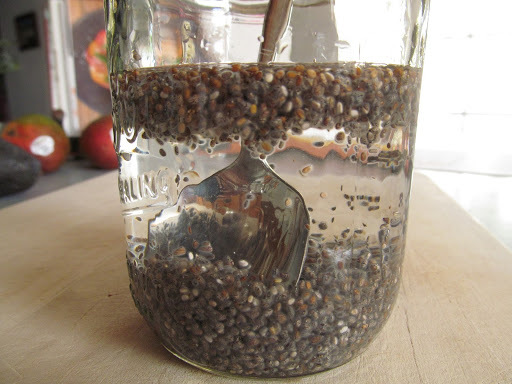 Chia seeds absorb liquid, creating a layer of gel around each tiny seed. 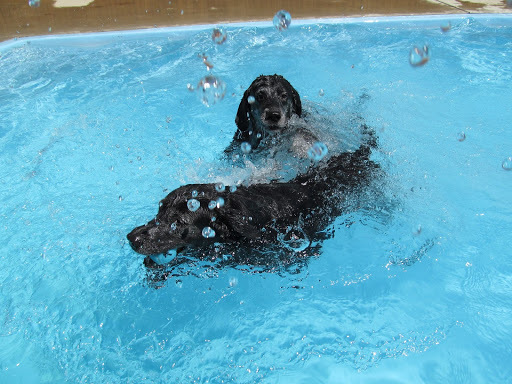 They tend to clump together in water, so be sure to stir them once or twice while they soak. 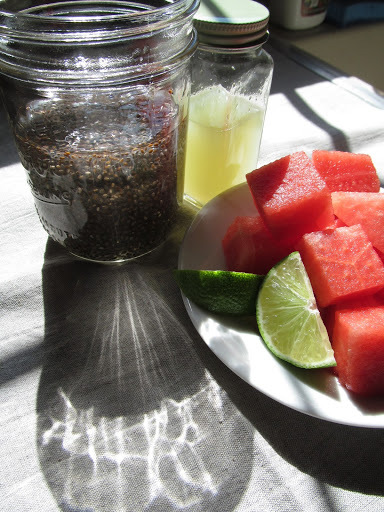 Next, I cubed and seeded about 5 cups of fresh, organic watermelon and tossed it in the blender with my chia gel, 1 cup of water and 1 tablespoon of freshly squeezed lime juice. You could add some sweetener (such as agave, maple syrup or stevia), however I was looking for something refreshing and fruity, but not too sweet. It only takes a few seconds to blend and this recipe made enough for a big glass to enjoy now, plus a bottle for my lunchbox. 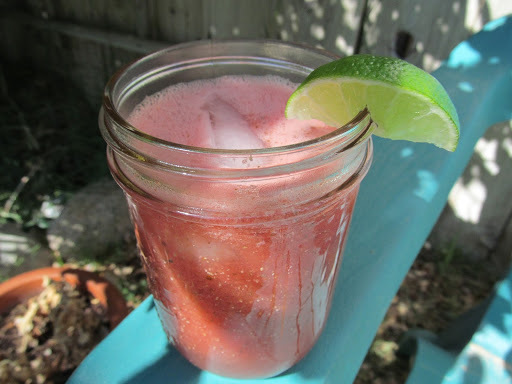 Pour yourself an agua fresca and take a few moments to sit back, relax and refresh. 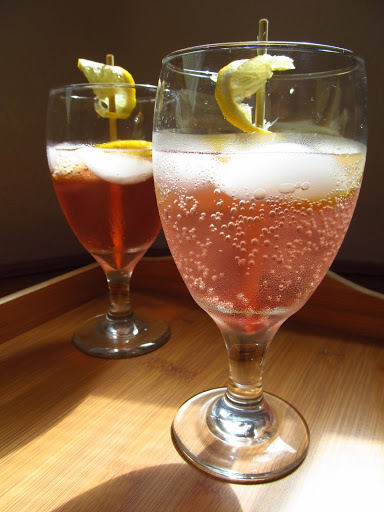 A simple glass of sparkling water with a little splash of fruity flavor is another healthy and refreshing way to hydrate while you go about your day. I like to add just enough fruit juice, like pomegranate or freshly juiced grapes, to give my water some flavor without all the sugar of a glass of juice. How can you not feel revitalized by a glass of fruity bubbles! I adapted this from a recipe that came from the Vita-Mix cookbook we got with our blender. Since it calls for whole fruits, a high-speed blender comes in handy. 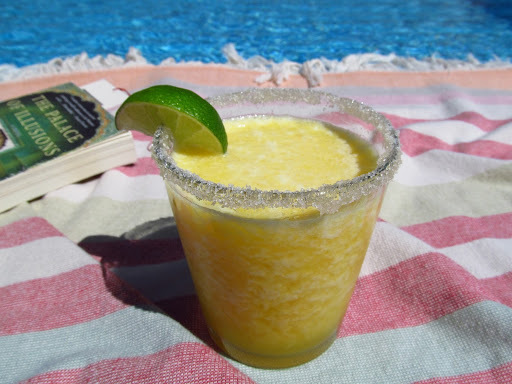 Simply combine the following ingredients and blend until it’s slushy and frothy. 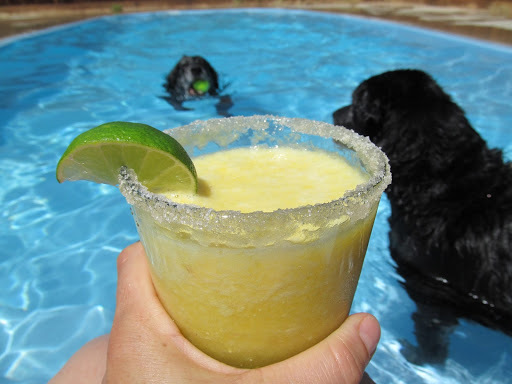 Pour some in a sugar or salt-rimmed glass and head to the pool to chill out and (as we like to say) cool the howlin’ dawgs. Ahhhh, now that’s more like it! Chillin’ chick, happy hounds. Have fun and revitalize your summer hydration by concocting your own fresh and healthy, thirst-quenching beverages.